National Pump & Energy (NPE) provide a complete range Bore Pump Hire equipment for borefield pumping, pipeline and monitoring services and capabilities to Australia’s mining, construction and agriculture industries. We have the people, products and expertise to deliver you solutions exceeding your expectations. NPE are Australia’s pump professionals, delivering turnkey Borefield Pump Hire solutions to our customers, covering everything from design and construct, to install and maintain, operate and decommission. 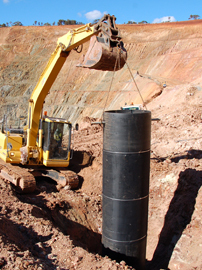 At NPE we understand the pump and pipeline requirements of a borefield site. Our professional team has extensive industry experience and we bring our comprehensive understanding of hydraulics and hydrology to the table, when developing solutions for each client, site and project. Strategic partnerships with internationally recognised pump suppliers and manufacturers, guarantees the quality and accessibility of an extensive range of specialised products and parts, including traditionally hard-to-source products such as specialised mine water pumps and dewatering pumps.